Part A. The Historical Stratotypes. Chronostratigraphic units: historical stratotypes and global stratotypes (G.S. Odin). The Aquitanian historical stratotype (A. Poignant et al.). The Burdigalian historical stratotype ( A. Poignant et al.). The Burdigalian historical stratotype in the Rhodanian area (S. Pouyet et al.). Sr isotope record in the area of the Lower Miocene historical stratotypes of the Aquitaine basin (France) (B. Cahuzac et al.). Langhian, Serravallian, and Tortonian historical stratotypes (D. Rio et al.). Calcareous plankton biostratigraphy of the Langhian historical stratotype (E. Fornaciari et al.). Planktonic foraminiferal biostratigraphy of the Tortonian historical stratotype, Rio Mazzapiedi-Castellania Section, northwestern Italy (P. Miculan). The Messinian historical stratotype and the Tortonian-Messinian boundary (M.L. Colalongo, G. Pasini). Proposal for the global stratotype section and point (GSSP) for the base of the Neogene (the Palaeogene/Neogene Boundary) (F.F. Steininger et al.). The Miocene-Pliocene boundary: present and future (J.P. Suc et al.). Part B. Geology of the Two Main Study Areas. Miocene Palaeogeography of the Tethys ocean; potential global correlations in the Mediterranean (B. Vrielynck et al.). Tectonic setting of the Miocene northern Apennines: the problem of contemporaneous compression and extension (G. Pialli, W. Alvarez). Geology, tectonics, and integrated stratigraphy potential of Japan (M. Takahashi, M. Oda). Part C. Studies Relevant to the Lower Miocene Subseries. Introduction (A. Montanari, R. Coccioni). Integrated stratigraphy near the Oligocene-Miocene boundary in the Piedmont basin (Italy): biostratigraphy and geochronology (G.S. Odin et al.). Integrated stratigraphy (biostratigraphy and geochronology) of the Early Miocene sequence from the Emilian apennines (Italy) (G.S. Odin et al.). Integrated stratigraphy of the Chattian to mid-Burdigalian pelagic sequence of the Contessa valley (Gubbio, Italy) (A. Montanari et al.). Potential integrated stratigraphy of the Aquitanian to Upper Burdigalian section at Santa Croce di Arcevia (NE Apennines, Italy) (R. Coccioni et al.). Biostratigraphy and geochronology of a Miocene continental volcaniclastic layer from the Ebro basin, Spain (G.S. Odin et al.). Part D. Studies Relevant to the Middle Miocene Subseries. Introduction (A. Montanari, R. Coccioni). Integrated stratigraphy of the Upper Burdigalian-Lower Langhian section at Moria (Marche region, Italy) (A. Deino et al.). Potential integrated stratigraphy in the Langhian l’Annunziata section near Apiro (Marche region, Italy) (A. Montanari et al.). Biostratigraphy and geochronology of an Early Serravallian volcaniclastic layer from Sicily (G.S. Odin et al.). Potential integrated Middle Miocene stratigraphy in southeastern Spain (Ch. Montenat et al.). The potential for integrated stratigraphic studies of Middle Miocene sequences in central Japan (M. Takahashi, M. Oda). Radiometric age of the first occurrence of Globigerina Nepenthes in the Tomioka sequence, central Japan (M. Takahashi, K. Saito). Géochronologie de niveaux situés autour de l’apparition de Globigerina Nepenthes au Japon et en Itali: âge de la limite Serravallien/Tortonien (G.S. Odin et al.). Part E. Integrated Studies Relevant to the Upper Miocene Subseries. 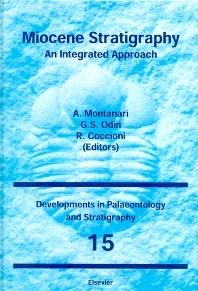 Introduction (A. Montanari, R. Coccioni). Integrated stratigraphy of the Middle to Upper Miocene pelagic sequence of the Cònero Riviera, Marche region, Italy (A. Montanari et al.). Integrated stratigraphy of the Late Tortonian Pieve di Gesso section (Romagna, Italy) (G.S. Odin et al.). Cyclostratigraphic estimate of the Messinian stage duration (G.B. Vai). Calcareous nannofossil biostratigraphy and paleomagnetism of the Monte Tondo and Monte del Casino sections (Romagna Apennine Italy) (A. Negri, L. Vigliotti). New radiometric datings bracketing the Tortonian-Messinian boundary in the Romagna potential stratotype sections (northern Apennines Italy) (M.A. Laurenzi et al.). Contribution to the geochronology of the Tortonian/Messinian boundary in the Faenza area (Romagna, Italy) (G.S. Odin et al.). Integrated stratigraphy of the Maccarone section, Late Messinian (Marche region, Italy) (G.S. Odin et al.). Potential integrated Upper Miocene stratigraphy in southeastern Spain (Ch. Montenat, F. Serrano). A review of geological, biostratigraphical, and geochronological studies of the Miura peninsula (central Japan) (K. Saito et al.). Preliminary results and potential for integrated stratigraphy of the volcano-sedimentary sequence in the Boso peninsula, central Japan (M. Takahashi et al.). Part F. Miocene geochronology: methods, techniques, and results (G.S. Odin et al.). Chronostratigraphy of Miocene stages: a proposal for the definition of precise boundaries (G.S. Odin et al.). References. Subject Index. ◊f; the establishment of Global Stratotype Sections and Points (GSSPs) for the definition of chronostratigraphic boundaries. This book constitutes an excellent and probably unique example of how interdisciplinary stratigraphic and geochronologic studies are approached with modern methodologies and techniques. It contains numerous unpublished, accurate radioisotopic dates of volcano-sedimentary layers interbedded in fossiliferous marine and continental Miocene sequences representing Mediterranean and Pacific environments. New, extremely detailed paleontologic data which constitute the basis for an accurate definition of the Miocene biostratigraphy, and the study of the ecologic evolution of Miocene marine environments are also included. The chapters are complimented by black-and-white photographs, graphic figures, and tables. Stratigraphers, paleontologists and sedimentologists plus geologists working in oil companies will certainly find this work of interest.